Help count hundreds of bats! No charge to participate, suitable for all. When Essex Wildlife Trust built the Visitor Centre at Hanningfield Reservoir they couldn’t have imagined they were creating what was to become one of the largest soprano pipistrelle maternity roosts in East Anglia. In fact it had been open several years before a young worker heard a strange squeaking noise in 2007. Fortunately, the Education Officer identified the source of the noise as bats in the roof above the education room. In the first year we carried out some monthly emergence counts before starting our regular fortnightly counts in 2008. 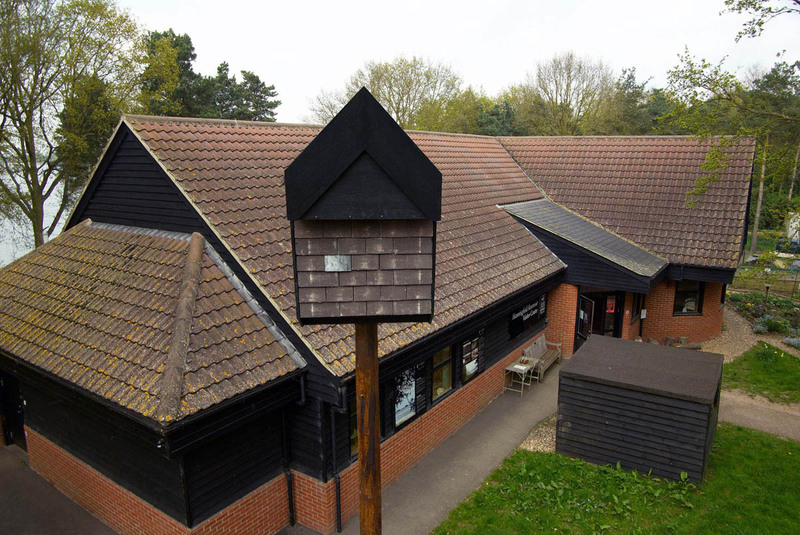 Whilst their chosen location provides a superb opportunity to watch the bats emerge it was not the easiest place to observe the activity in the roost and 2009 we were donated a large bat box which was mounted on a pole just outside the visitor centre. The hope was that the bats would move across and we could put cameras in the box. For several years a handful of bats would use the box but it was not until autumn 2015 that significant numbers were seen emerging and in 2016 the numbers continued to increase. As well as watching the main roost and the box we have observed bats emerging from three other locations around the building. From 2008 until 2014 the peak numbers fluctuated slightly from year to year but were between 450 and 500. In 2015 the roost grew with almost every count beating the numbers from similar times in previous years with a yearly high of 676. In 2016 it grew again and in early July it reached 1000 for the first time. The counts are a good opportunity for new bat enthusiasts to see them emerging from the roost. It is also interesting viewing for the more experienced observers. No equipment is needed but we do suggest you bring along a seat (a hat, coat and gloves is also useful as it can get chilly after sunset). If you have a bat detector, bring it along but we usually have a couple available to listen to them both prior to emerging and then flying around. *July 26th (public bat count, needs to be booked through the Essex Wildlife Trust website. If you are interested in attending, please contact Pete Claughton: hannersbats@gmail.com. Pete will email details of meeting times a few days before each count.